In a small bowl, mash banana and the sweet potatoes together. Mix well with eggs, the peanut butter, and cinnamon. 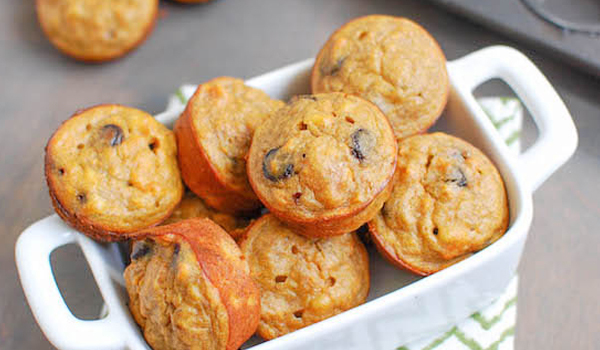 Add any additional ingredients and stir until greased mini muffin tins. Bake at 375 degrees not less than 18 minutes. Other pureed fruit such as applesauce can also be used instead. It may taste less sweet but still nice. If desired, a splash of vanilla extract can be used to enhance the flavor. Serves:14 | Servings: 1 mini muffin or 1/14th of the recipe | 47 cals | 3 g fat | 0.7 sat fat | 3.7 g carbs | 0.7 g fiber | 1.6 g sugars | 2.1 g protein | PointsPlus: 1 | SmartPoint: 1.